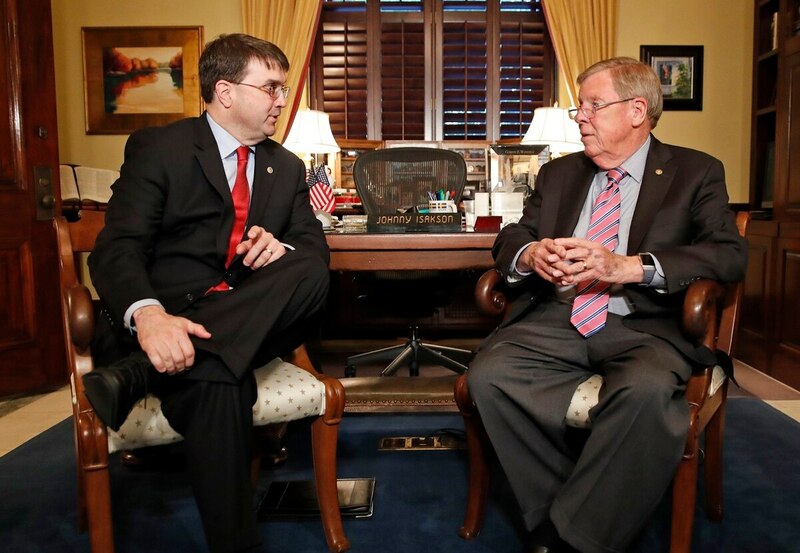 WASHINGTON — Key lawmakers on the Senate Veterans’ Affairs Committee don’t expect allegations regarding Veterans Affairs Secretary nominee Robert Wilkie’s past political views to upend his confirmation process, but they do expect debate on the issues during his public hearing this week. On Tuesday, in a profile of the Wilkie, the Washington Post noted a number of controversial stances in the longtime bureaucrat’s past, including advocacy for former Sen. Jesse Helms that had racist undertones and active work with the Sons of Confederate Veterans, a group that defends public displays of the Confederate symbols. Wilkie, a North Carolina native, also worked closely with former Sen. Trent Lott and former Secretary of Defense Donald Rumsfeld, and was seen as a vocal advocate for some of their controversial policies. The allegations date back several decades in some cases, but drew concerns from some veterans advocates given the high-profile nature of the Cabinet post. Trump's latest nominee for the top VA job will face tough questioning from senators next week, despite wide support for his bid. But committee chairman Sen. Johnny Isakson, R-Ga., said Wilkie discussed those issues with him weeks ago, and the senator considers it a non-controversy. Committee ranking member Sen. Jon Tester, D-Mont., said he expects the issue to be a major point of conversation in Wednesday’s confirmation hearing. Wilkie, 55, currently serves as the Pentagon’s under secretary for personnel and readiness and was confirmed to that post without controversy by the Senate Armed Services Committee last fall. He worked as acting VA secretary for two months following the sudden firing of former VA Secretary David Shulkin in March, and was tapped as the nominee after Rear Adm. Ronny Jackson withdrew his name from consideration for the job amid allegations of unprofessional behavior while working as White House physician. Defense officials are currently investigating those charges. Wilkie is an Air Force Reserve colonel who previously spent time in the Navy Reserve. He is also the son of an Army artillery commander, and has spoken frequently about growing up on military bases and the challenges his family faced in dealing with his father’s combat injuries. His nomination has largely been greeted with praise from veterans groups who saw him as a stabilizing force within the department in recent months. He also boasts a close relationship with Defense Secretary Jim Mattis, one of Trump’s most publicly popular Cabinet secretaries. Wilkie was on Capitol Hill Tuesday to meet with lawmakers in advance of Wednesday afternoon’s confirmation hearing.